L’Association des Amis de l’Orgue de Saessolsheim prépare son stage d’orgue. 19 participants sont inscrits, venant de France, d’Allemagne, de Suisse, du Japon, de Corée. Les cours seront donnés en Français, allemand et anglais. 7 concerts d’orgue par les 4 professeurs du stage en 7 jours sur 8 instruments, à travers tout le département du Bas-Rhin. 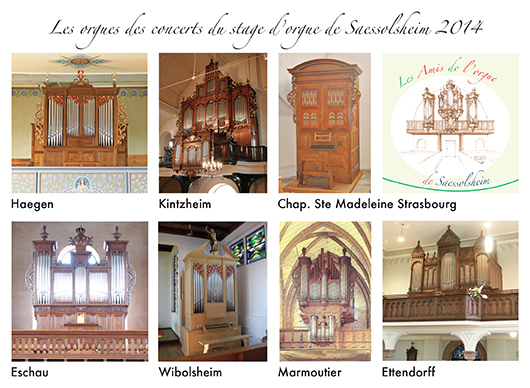 • Organ-academy from july the 23th to july the 30th, 2014 in Saessolsheim (Alsace, France), around the B. Aubertin organ. Theme of the akademy : Repetory from baroc to Brahms ; improvisation ; clavichord. 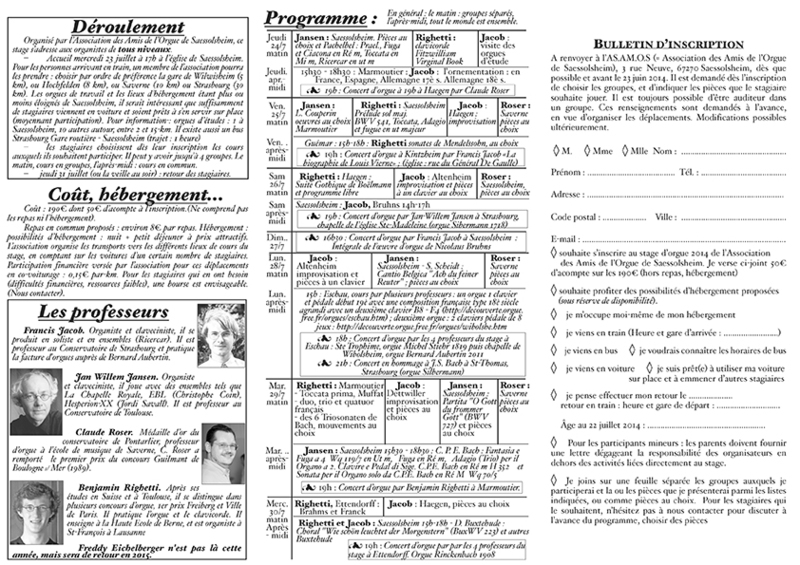 Detailed program : see the document (written in French, but that should not be a problem for people to understand the days, and the titles of the pieces proposed : please click on following link to download that document : dépliant du stage ). Most days are organised that way : morning, 3 or 4 small groups, each one with one teacher, afternoon : all participants together. – Begining Wenesday, July the 23th at 5 PM in the church of Saessolsheim. For the persons coming by train, a member of our association can take them at the station (there isn’t one in Saessolsheim) : choose best the station of Wilwisheim (5 km from Saessolsheim), or Hochfelden (8 km), or Saverne (10 km) or Strasbourg (25 km). Possibility to come from the airport also. There are also bus from Strasbourg to Saessolsheim. Study organs are available in villages around Saessolsheim. Some solutions for sleeping are also outside of Saessolsheim. So it will be good if the participants who come by car could help to transport other participants. The association will organise exactaly those deplacements and give some money to the drivers for the cost. – the lessons are described in the specific document. For a good organisation, the participants are asked to give on a separated paper, with their inscription the complete list of the groups they want to integrate and the pieces they want to play. – thursday 31th of july (or wenedsay evening) : back-travel of the participants. The lessons of Claude Roser, Jan Willem Jansen, Francis Jacob et Benjamin Righetti are given on the program indicated, and on works on free choice, if there is some time left (normally not so much). • Price : Pedagogical costs 190 Euros (50 Euros prepayed with the inscription). This price doesn’t include sleeping and eating. 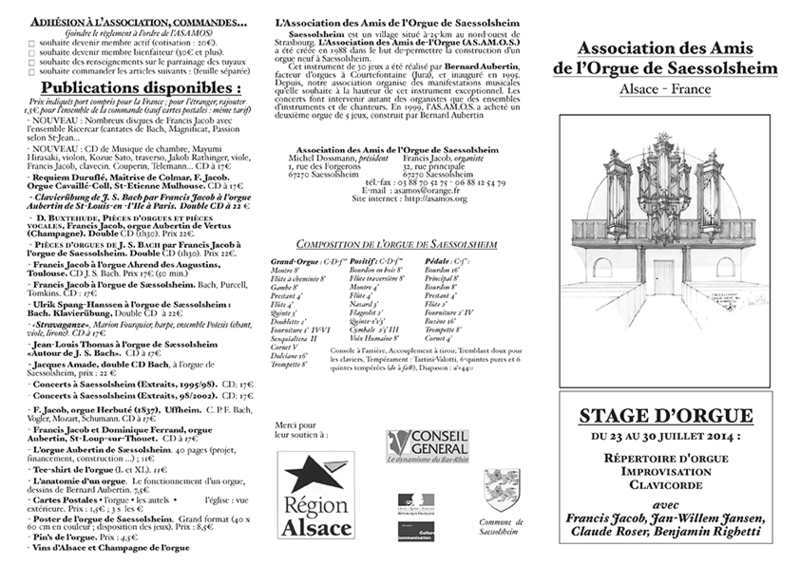 o wants to participate to the organ-academy 2014 of the Association des Amis de l’Orgue de Saessolsheim. I send with this inscription 50 Euros, part of the total of 190 euros for the participation (not including sleeping and eating). If it’s to complicated to send money from a foreign country, it’s possible to pay all in Saessolsheim, but our Association wants in this case in the eventuallity of the no-coming of a participant to be informed as soon as possible. In the case of deciding with our association that everithing will be payed on place, inscription has not to be by paper-mail, can be in this case by E-mail. o if available, I would like to have a room provided by the association. (exact price given later). o I will come by car. o I agree to take my car and to take with me other participants for the academy. o I will go back on following day : ……………………. o I will go back with following train : time and station : ……………………. o For the participants under 18 years : parents have to write and send a letter which clears the association of the responsabity of their son or daughter outside the times of the normal activities of the academy.